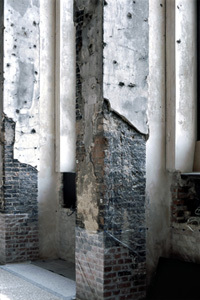 The Buildings and Structures exhibition concentrates on works from the Neues Museum, Palast, La Jolla and Jets series. The titles themselves point to the fact that Thomas Florschuetz (*1957, Zwickau) deals with prominent architectural structures such as Oscar Niemeyer’s buildings in Brasilia, Louis Kahn’s Salk Institute in La Jolla, the Neues Museum, boldly restored by Chipperfield, or the ruin left by the demolition of the Palast der Republik in Berlin. His fascination with clearly defined shapes, such as steel beams, columns and window frames, and his feel for the monumental dimensions of his motifs, is also strongly reflected in his Jets series. 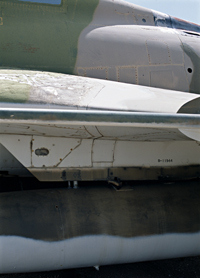 The large-format pieces show details of decommissioned military jet aeroplanes in the Pima Air and Space Museum in Tucson, Arizona. In spite of the close-up frontality that takes up nearly the entire frame, his use of focus and lighting makes the size of the aeroplanes almost tangible. The monumental pieces by Thomas Florschuetz are produced in series, with motifs that are shot from perspectives that vary only slightly from one photograph to the next. It is always fragments; the depicted elements are only touched on, incomplete, but Florschuetz still creates balanced, harmonious pictures with fragments that always serve the composition. The conflicting experiences in viewing his works come as a surprise. On the one hand we have the strange flatness of the pictures, in which the different structures and colours appear to be composed in the abstract. But then the perception topples into a deep three-dimensionality in the photography in the manner of an optical illusion. The spatial alignment in the three-part work Enclosure (Neues Museum) 11 for example creates an inescapable maelstrom. The sheer size of the piece alone makes this effect physical. With the intense exploration of each motif, be it his own body, orchids, architecture or aeroplanes, Thomas Florschuetz creates impressive visual worlds that work on graphical, physical and planimetrical levels – sometimes on all three at the same time. The exhibition shows an extract from Florschuetz’s multilayered work that was most recently honoured with the extensive Imperfekt retrospective in the Kunsthalle Tübingen (17 July – 26 September 2010) and that will be shown in the Museum Palatine Gallery in Kaiserslautern on 28 January. A catalogue accompanying the Imperfekt exhibition has been published by Verlag der Buchhandlung Walther König and can be ordered through the gallery.